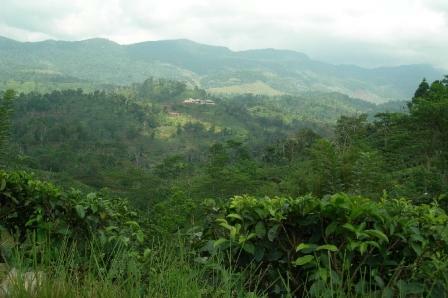 Helen – We left the house at 7:30 am for the tea plantation just outside Deniyaya. Kanthi thought it best if we hired a driver since we wouldn’t be able to read signs or ask for directions. She found a Tuk-Tuk driver from the university to take us. He came a little late and then we had to go back to his house because he forgot the directions and phone numbers. How’s that for a good start?? He wasn’t used to an automatic transmission and had a little trouble on the switchback mountain roads being in the wrong gear or going too fast in the gear he was using. Tom finally had to explain it to him though he didn’t know English very well so who knows what he comprehended. He drove like a bat out of hell and I was thankful that I was in the back seat. The scenery was lovely once we got out of the city and started going inland. We went through several smaller towns and they all seem the same: congested and dirty with nothing I wanted to stop and see. The distance covered was about 50 miles and took us over 2 hours; I will leave the rest to your imagination. Dr. Kamala (don’t get confused with our house agent) the owner of the first smaller tea plantation is a very good family friend of Kanthi’s husband; both husbands had gone to school together when they were young. 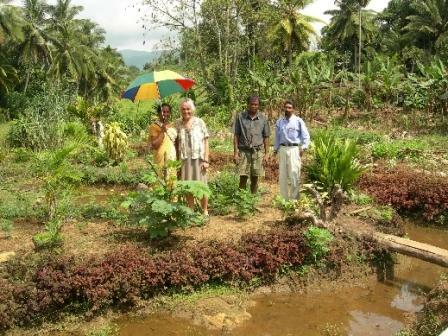 Therefore, Kanthi had asked her to show us her plantation and property before continuing to the tea factory. When we arrived she had a lovely tea table set with cheese, biscuits, bananas, and local sweets. She didn’t speak English very much though she could read and understand it very well. She had no one to practice speaking with and therefore felt inadequate using it with us. Her husband (also a physician with a clinic in town) had asked another friend, Nicki, who previously worked in the tourist trade and spoke English, if he would be available to spend the day with us and he did. While we had our refreshments, Nicki explained that Dr. Kamala had a small clinic at the end of her driveway to serve the locals with their medical needs. She is considered quite the gardener and is responsible for cultivating the tea harvest along with many other agricultural endeavors. 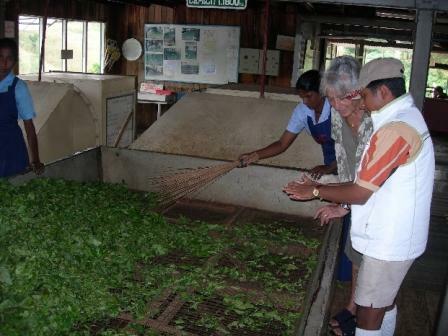 Many of the smaller plantations harvest tea leaves and then sell them to the local factories to be processed. 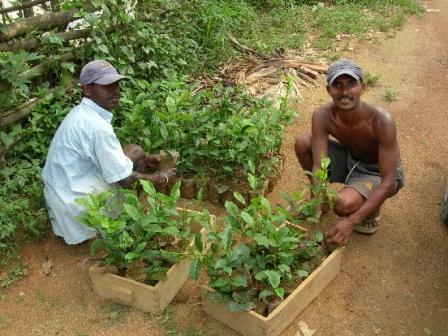 She plants black pepper trees and clove trees in with the tea bushes to shade them and thus has another product for income. 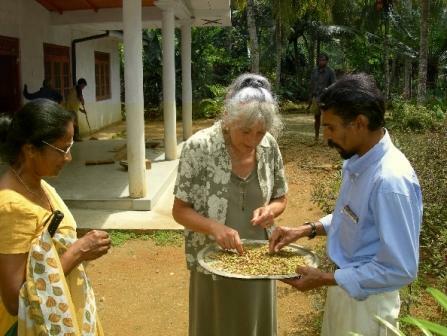 She also cultivates cardamom, cinnamon trees, several orange trees, wood apples (nothing even close to our apple!! 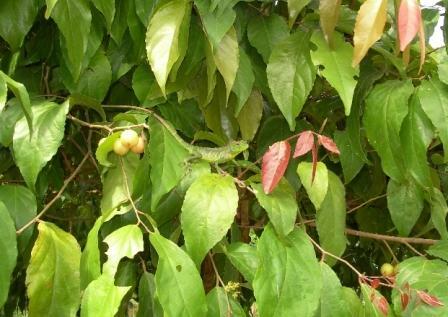 ), mangos, papayas, and herbs. I am sure that I have forgotten several of the other crops. She showed us how she devised a watering ditch system for the garden and took us to the fresh water well which was fed from a natural spring. There we found her pet tortoise which at the moment was the size of a large coconut. They are expected to live 300 years (ok, Heather, who is going to take care of Fred after the next 60??) She also showed us pictures of her dogs. There were 4: a tiger Boxer, a German Shepherd, a pomp Marian, and a brown one with a white chest. Nicki said that she treats them better than most people do their children, so we were surprised to see them in separate cages and not near each other. Near the garden they are building a new house for their daughter who is in medical school. I asked if she was engaged…of course not, but you have to plan ahead for the dowry. On first glance the house looked great with the wooden inserts above the windows and doors for ventilation but inside you noticed how lacking the electrical and plumbing systems are. The kitchen was therefore also very primitive according to our standards. The bedrooms were small with only one electrical outlet per room. Her 83-year-old mother was staying in one of the bedrooms at this time. Nicki was now going to take us to the Hanford Tea Plantation Factory while she prepared lunch for us. We never expected such gracious hospitality. She is a very warm, vivacious person and I wish that we were able to communicate better. The tea factory was just a short distance away. Some of the early pictures in the office dated back to 1926. 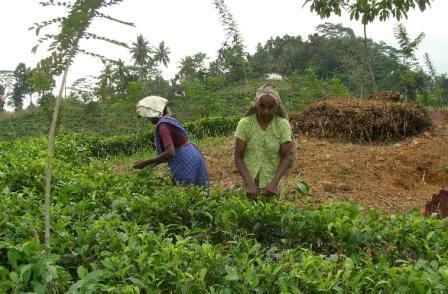 The tea plantations were originally privately owned and operated, then they were nationalized but production fell because people felt separated from their crops. The plantations were then privatized again with the smaller ones growing, picking and selling their leaves to the bigger factory for processing. This is the slow season therefore we were the only visitors on tour. The assistant manager gave us a personal tour and explained the operations. 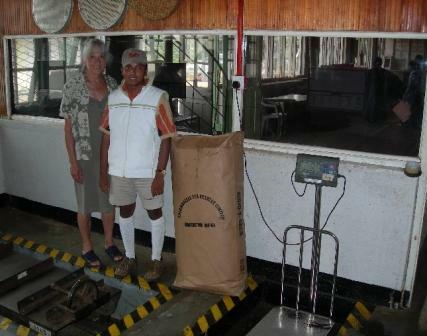 In a nutshell: the leaves are brought in fresh and green to be weighed and recorded at the entrance. The leaves then go to the upper level where they are spread on 100 foot long wire mesh tables with fans blowing on them to extract moisture. This takes about 2 hours. Then the leaves are dropped through a shute to the level below where they go through a spinning/grinding press for 20 minutes to twist the leaves. 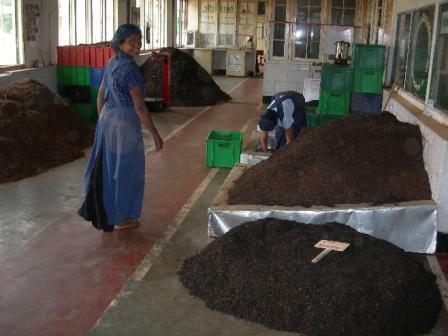 This process is repeated at least two more times to twist the leaves and extract moisture. 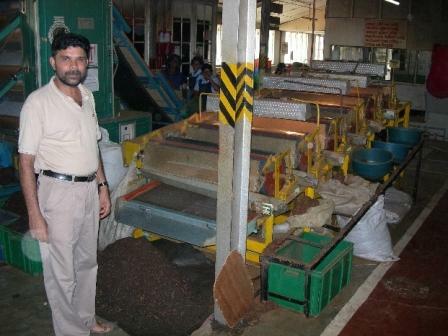 Next they go to a conveyer belt which takes them through the heater to dry them. Afterwards, the leaves are sorted from the stems before they are graded into at least 8 categories. 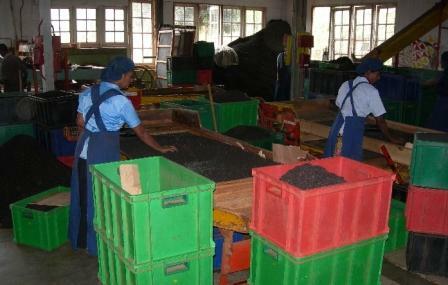 They are bagged and labeled and sent to auction in Colombo. We were given a kilo of tea as a present and all this was done free of charge!!! They were very nice to us. Our next stop was to Nicki’s brother-in-law’s house where his young wife prepared tea for us. He is the youngest manager of a tea factory. I think Nicki thought we might want to see another factory but there was an accident and his brother-in-law only stopped in to say hello and had to leave. We were not disappointed. Their house was directly opposite the factory because it was good practice to have the manager close by to oversee the factory. It was a very modest (tiny and sparsely furnished) home for a man of his position. The room where we sat only had four caned arm chairs, a buffet, and a table on the side which their daughter used as a desk. We were presented with another gift of tea from this factory. Returning to Kamala’s house, lunch was ready and we were hungry. She prepared everything with Tom’s tummy in mind and we thoroughly enjoyed every single entrée. Nicki and the driver also ate with us but Kamala did not. She sat at the table with me and we tried to carry on a conversation such as it was. We had papayas with lime juice for dessert as well as curd (like a yogurt) with a sweet honey mixture. When it was time to leave, she had a goody bag for Kanthi and another one for us which consisted of wood apples and another fruit similar to persimmon in taste but with a hard shell along with king coconuts, and tea (surprise!). We hugged several times and were sad to say good-bye. I really would have enjoyed talking with her!! We stopped at Nicki’s humble abode on the way into town. It was a two room house on top of another hill. The outside kitchen was fueled with firewood under a lean-to of sorts. His wife is a teacher in the primary grades in town and now that he is not working with the tourist trade, he is Mister Mom. They have two daughters; one six and one 16 months. He does the washing (carries water from local water outlet) and child care but his wife cooks when she returns home. In the morning they use a gas burner because it takes too long to use the outdoor kitchen but it is too expensive to use for larger meals. Nicki was constantly telling us how he is Catholic and happy to be able to help us that day since it was Saturday and his wife was not working. He was happy to accommodate the doctor (Kamala’sside with the birds, animals, and plants. He would not sell the land to the water tower agency and so they had to build it a little lower on the hill. 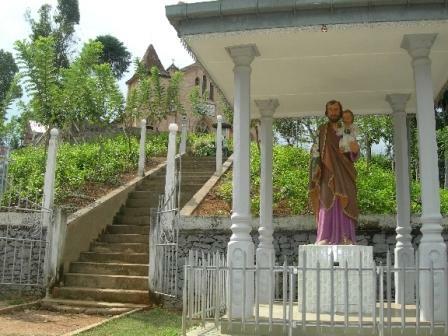 We stopped at the Catholic Church, St. Joseph, where his father is buried. It was humble but nice with a few stained glass windows and was in the process of being repaired. Nicki continued with us into town to meet Kamala’s husband at his clinic and then we were off to find Kiruwananaganga Falls – about 100 ft wide and 100 ft high (coming down in layers). The road was really bad and if we hadn’t been able to ask directions several times to be sure we were going in the right direction, I am sure that Tom would have turned back. 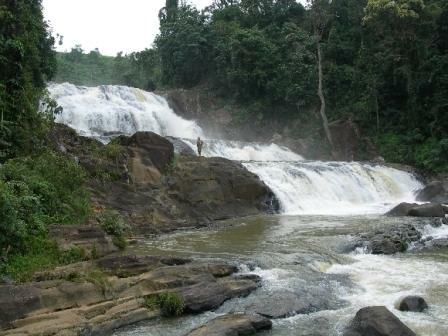 The falls were worth the effort and lots of water was flowing over the top even though this wasn’t the rainy season. At one time there were seven steps to the falls but now only four remained because of gem prospectors. We then went back to town to meet the doctor and Nicki’s family. Kamala’s husband (name?) seemed like another great person, though we were only able to shake hands and smile at each other. Saying our goodbyes, Tom gave Nicki a little something ($20, about a week’s wages) for his guiding efforts and he was very thankful. He was very helpful though he talked non-stop, repeating things several times to be sure we “got it” and would say “remember” before repeating something one more time. It was nice to have the quiet once we dropped him off. There was one more stop before heading home. We wanted to see the Rock Temple in Kotapola which we thought was just on the side of the road. Wrong, what we saw was the entrance, a steep road with many sharp switch backs (where the driver had trouble with the transmission) had to be negotiated to get to the temple area. When we reached the top you could smell something burning, Tom thought the transmission! The driver waited in the parking lot while we took off our shoes and climbed the steep stairs to the cave temple. Inside a large reclining Buddha rested with eyelids half closed and the curtains drawn around him. Once again the inside of the temple was richly painted. We continued to the next level where a pointed dome (dagoba or stupa) is erected to house the holy relics. Rushing down we were anxious to be on the road and to hopefully return to Matara before nightfall. Our driver was more careful on the return trip but he increased his speed as we got closer to home. Night had fallen when we were in the city and again it reminded us why we don’t like to drive at night. The street lights (those that exist) are not very bright, bikes have no lights, some motorcycles don’t use theirs, and people run into the road trying to cross wherever they can and I hold my breath. We had cold left over salads for dinner and just collected our nerves before going to bed.